At that time, the idea of coming to Asheville to work at Abbington Green Bed & Breakfast Inn hadn’t yet been hatched. Somehow, though, the guests had a premonition that I’d be here permanently and wrote out this list, David Letterman Top Ten style, to influence a decision to come and work at the Inn should the opportunity arise. 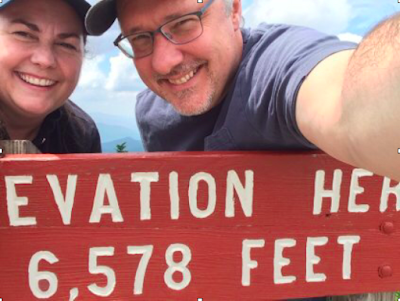 And the #1 reason to move to Asheville and work at the Inn…Never miss an opportunity to work with someone you love. So…that is just what we did. Our lease in Connecticut came to a close and we moved to Asheville this past June. We love it here and we’ve never looked back. We are still exploring and learning about the area. It is always fun for me to hear about what the guests are up to during their day as it gives me great ideas of things to do on my days off. We have a list of restaurants (really, it is the one that Nick sends out to our guests that are his favorites) that we have been exploring and my husband and I have no trouble hopping in the car and taking off to see the sights from the Blue Ridge Parkway, visiting an orchard or two, or picking an interesting named place (like Bat Cave) and pointing our car in that direction. 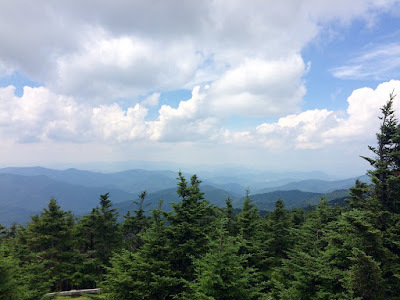 We have always loved taking drives, and living in Asheville has certainly given us inspiration to get in the car and go! Beauty surrounds you here in Asheville. It catches me by surprise every now and again. The mountains, beautiful sunsets, getting to see a black bear in the mountains…it is all a part of the Asheville experience. In addition, the great restaurants, shops, donut shops and ice cream joints will keep me busy exploring for a long time. Not to forget the Biltmore Estate and its beautiful grounds…we have season passes now and popping over for an afternoon is in our plans. Abbington Green is also such a pretty place to get to come to work in every day. This historic house is one of a kind, and getting to see our guests appreciate it is very rewarding. As I type this, there is a lively 5pm Social Hour taking place on the grand front porch of the Inn. Conversations are easy, wine is flowing and friendships are being forged. It is terrific. It is an exciting time to be at the Inn and to be in Asheville. I'm honored to work with this wonderful team and I look forward to having the chance to meet you and have you stay with us!